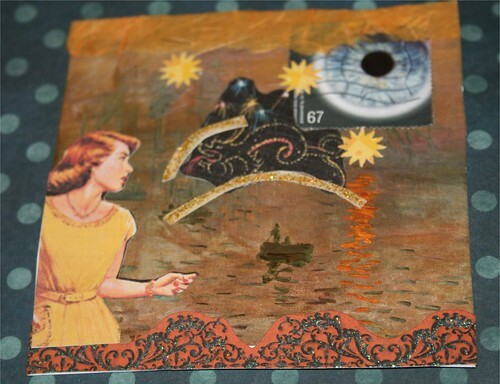 Watching 4" x 4" Collage card, originally uploaded by DianthusMoon. I made this after talking to my uncle who gave me very short answers and acted like he didn’t want to talk. I feel so bad for him laying there in the hospital for over two weeks. He is still very weak. Sean and I watched a kind of creepy movie called ‘The Lovely Bones’. It was suppose to take place in Norristown, PA, about 45 minutes or so from here. The author is from Malvern where Brian grew up. What’s creepy is the 14 yr old girl gets murdered by her neighbor. I was the same age as her in 1973. I had the same pencil box. We now have the same green lidded candy dish as the neighbor. Yikes. So after Susie is killed, she’s in like a pergatory and she sees big things and wild things. I guess my collage is influenced by that and this guy Randall who makes the same size cards and sells them for $25 each. There’s an idea! Brian went to get bloodwork today, so wish him luck. He may have to get a few things checked out. His dad is getting his cataract consultation on Wednesday. I asked if he would not get the surgery on the 19th for obvious reasons (like I only have one birthday a year and he hasn’t been to the eye doctor in 15 yrs.). I’m in the process of my pre-holiday cleaning. I can’t stand to have to clean and decorate-too much work. My back has been bad, especially if I sit on the floor or do too much leaning over. Ugh. Hey, did you recognize Nancy Drew up there? Hope your uncle is doing better and you get the eye issue resolved with your FIL. I read the book The LOvely Bones years ago when it was an Oprah Book Club book and found it creepy. Teaching eighth grade language arts–the kids love the book and movie because of the creepiness.